I know Halloween was a week ago, but I still wanted to share my second set of Halloween-themed nails. I used a black nail polish with a thin brush to create the lines for the spiderwebs on one hand. Then I used the end of a pen and a bobby pin as dotting tools to make the ghost faces on the other hand. 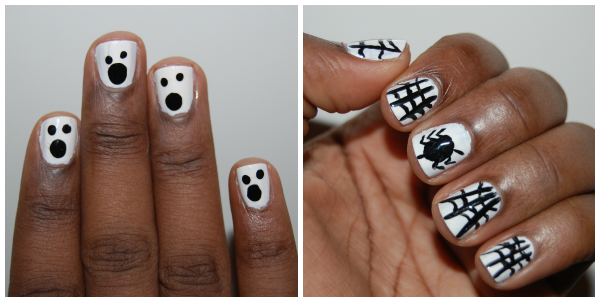 Neither design took a long time and when I was finished I had one spooky set of nails! Check back tomorrow for a few snaps from my Halloween Housewarming Party!